Nepeta faassenii growing herbaceous of the genus Nepeta also known as Catmint or Garden catmint, perennial evergreen or cold deciduous used as ornamental attract pollinator and ground cover plant, can grow in temperate, mediterranean, subtropics climate and growing in hardiness zone 3-10. Leaves color green in heart shape, on the leaves there is pattern of cubic. Flower color purple or blue the flowers grow in inflorescence. 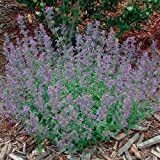 (12 Plants Classic Pint) Nepeta x faassenii Walker's Low Catmint is Covered in Sprays of 6" Tall, Pale Lilac to deep Violet Flower Spikes Beginning Late Spring and into The Fall.